Some things just have a way of becoming part of the landscape, whether they’re intentional landmarks or not. Even if it’s a place you never visited—if you saw it routinely for over three decades, you just got used to it being there. And it’s always a bit of a shock when it disappears. 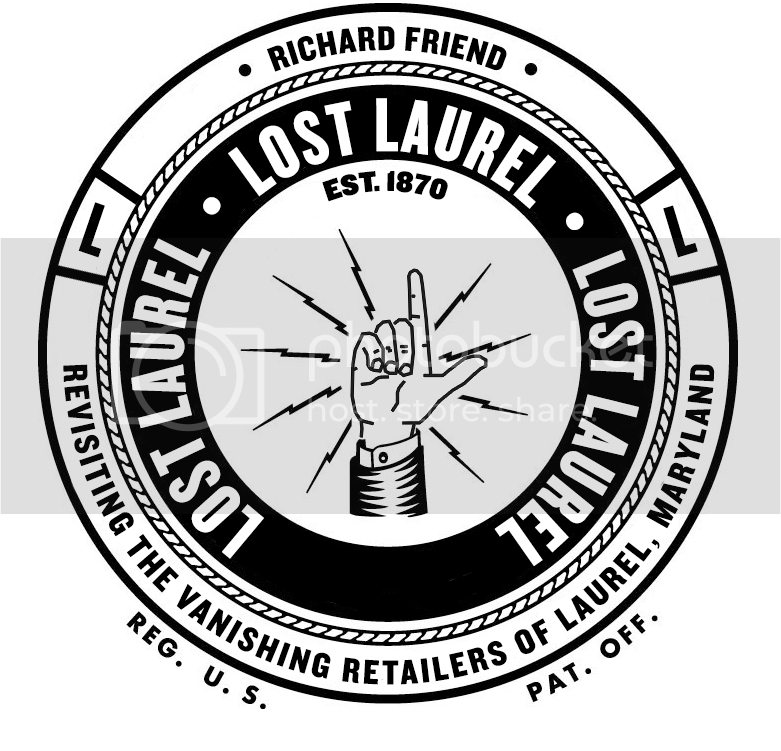 Ordinarily, I’d be talking about a store, a restaurant, or some other long-time Laurel business that’s shuffled off into the sunset. But this time, it’s a piece of playground equipment. Not just any old swing set, sliding board, or merry-go-round, though—this was originally a real, working fire engine for the Hillandale Volunteer Fire Department. But in the summer of 1980, it somehow ended up in the Pallotti Early Learning Center’s playground. And ever since, the unmistakable red fire truck had remained a truly unique piece of equipment for kids to explore and enjoy. After 36 years, the corner of Montgomery Street and St. Mary’s Place is going to look quite different without it. Laurel resident John Floyd II probably knows far more about fire trucks than you or I ever could, and he was there last Monday when the old truck was excavated and hauled away. Former volunteer firefighter Dave Hilliard plans to use its parts to restore a similar fire truck in his possession; and he agreed to take the truck now that now that Pallotti’s daycare staff and children have left the area and moved into a new building nearby. On Monday morning, 24th August 2015, a battered and forlorn-looking old fire engine that had been a familiar sight in Laurel MD’s Old Town district for three-and-a-half decades was dug out of its earthen plinth in Pallotti Day Care Centre’s playground, hoisted aboard a heavy-duty roll-back truck after some careful manoeuvres, and taken away to its new home between Gambrills and Crownsville MD. The fire engine is a 1955 American LaFrance 700 Series pump that was delivered new to Hillandale VFD in Montgomery County and served there until the early 1970s. After a few years of private ownership, the scruffy-looking and slightly-rusty engine was donated to the Pallottine Sisters for use in their children’s playground and it arrived behind a tow crane in June of 1980. Soon, the engine was “planted” in just the right spot with decorative stones all around, painted bright red, and kitted out with wooden platforms topside for the children to climb and play on. Every few years, the school’s maintenance staff would slather a fresh coat of red paint on the engine by hand with brushes and this has preserved its sheet metal and inhibited rust over the decades. The rig’s bronze 750 gallons-per-minute fire pump and Continental 6-cylinder motor were left intact and have remained un-disturbed. Eventually, those charged with keeping the engine painted started cutting corners and painted over everything: chromium trim, headlamps, running boards – fresh, bright red on everything except the bumper! Saint Vincent Pallotti High School, in whose building the day care centre had operated, has been expanding with increased enrollment and needed more space, requiring the day care and playground to be moved to the northern end of the city block-long property. Alas, the fire engine was too large to be placed in the new playground area so it had to go. Some time ago, I suggested that Hillside VFD fireman and vintage fire engine collector David Hilliard contact the Pallottine Sisters to see what they intended to do with the engine and earlier this summer, they graciously decided to give it to David with the proviso that he remove it from the property when the time came . . . and that time finally came! 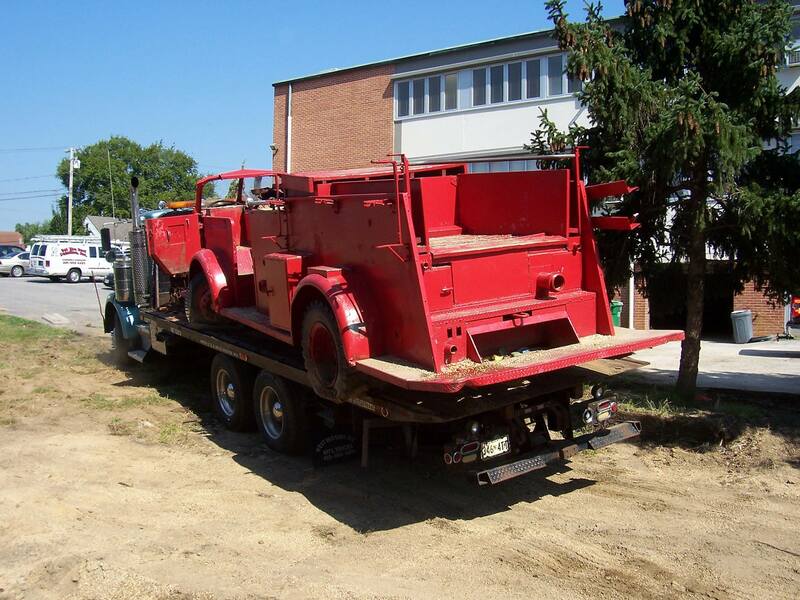 With the assistance of Berwyn Heights MD fireman and fellow collector Jimmy Woodhouse, N&S Towing of Beltsville MD, and Larry Frederick along with days of digging around the engine and other preparation work, all was ready for the move. Several of us arrived at 9 am and soon, we were joined by Sister Karen Lester, Hillandale VFD fireman Earl Clime who’d worked with the engine long ago, Laurel Leader newspaper reporter Andrew Michaels, the day care centre’s director, several school staff, and a whole bunch of little kids, some of whom were quite sad to see “their” fire engine going away! So sad to see it go! I guess it was time, but disappointing nonetheless. This is a sad reminder that all things must come to an end! Thank you ever so kindly for sharing my story and pictures, Rich!